What’s wrong with the 2012 TIPNIS consultation? It’s the request of the people, the community members, their corregidores [a traditional leadership post] and leaders, through the prior consultation carried out within the territory itself. We have exercised our right to be consulted as Bolivians and as indigenous people who inhabit the region. Subcentral TIPNIS leader Fernando Vargas Mosua and Adolfo Chávez, president of the Confederation of Indigenous Peoples of Bolivia (CIDOB), addressed the Inter-American Commission on Human Rights (IACHR) on Friday, March 15. The hour-long hearing was the culmination of a weeklong trip aimed at putting the Isiboro Sécure situation on the hemispheric human rights agenda. The visit came in the third year of high-profile campaign to prevent the Bolivian government from building a highway through the Isiboro-Sécure National Park and Indigenous Territory (TIPNIS; past coverage). Since their march to La Paz in 2011, residents of TIPNIS have experienced restricted freedom of movement. Military detachments, variously labeled an “environmental brigade,” an anti-narcotics measure, and part of “integrating the territory under state control,” restrict access and have hampered the activities of external organizations. Boat fuel, the essential ingredient of mobility on the rivers, has been tightly regulated as a “narcotics precursor.” Meanwhile the Bolivian government backed its own parallel leadership for CIDOB and assisted in evicting Adolfo Chávez and the rest of its elected officers from their headquarters in Santa Cruz. Domestic and Amazon Basin-wide indigenous organizations continue to recognize his leadership. The leaders called the IACHR’s attention to a series of violations of the collective and individual rights of the sixty-four indigenous communities. Their community structures, including local traditional leaders called corregidores and the territorial organization Subcentral TIPNIS, have been bypassed by the government as decisions are made about the route for a Cochabamba-Beni highway. Police officers and military troops attacked and imprisoned hundreds of members of a pro-TIPNIS indigenous march on September 25, 2011. Despite formal complaints and the presentation of forensic reports on injuries to seventy protesters, the official investigation into abuses that day remains stalled. At the conclusion of the 2011 march, the government capitulated and passed Law 180, designed to permanently protect the territory as an “intangible zone.” However, a December 2011 agreement between the government and the indigenous communities to implement the law was never put into effect. Instead, the government has unilaterally declared that “intangibility” means that nearly all economic activities – including eco-tourism, sustainable nut and cacao harvesting, and other projects previously approved – must be suspended until the communities accept the construction of the highway. In 2012, the Bolivian government approved a Law 222 allowing for a community consultation on the future of the territory. However, the terms of this consultation were never coordinated with the local indigenous organization, despite an order from the Plurinational Constitutional Tribunal that the consultation would only be legal if agreed to. The government’s consultation went ahead despite multiple institutions complaining that it failed to meet the most basic of international standards. The “consultation” was accompanied by the public bestowing of gifts and development assistance that were explicitly conditioned on acceptance of the highway. Late last year, a joint survey team led by the Catholic Church and the Permanent Assembly for Human Rights, found that the consultation was neither free, nor informed, nor prior – the essential conditions of its legitimacy. Fernando Vargas sought the Commission’s presence to clarify the facts, its intervention to maintain in force Law 180, and its determination that the Bolivian government’s obligations to protect the TIPNIS indigenous’ collective rights have not been met. The Bolivian government brought a sizable delegation to the Commission, led by Minister of Government Carlos Romero. For its part, the Bolivian government’s presentation reviewed another version of the TIPNIS story that focused on who should represent the interests of the indigenous community. Most of its allotted time was given to pro-government indigenous leaders, Melva Hurtado, Pedro Vare, Carlos Fabricano, and Gumercindo Pradel. Respectively, they come from the parallel CIDOB leadership elected while the 2012 indigenous march was still in La Paz, a Beni indigenous organization, and communities on the Sécure River and in the colonized zone of TIPNIS who are affiliated with the coca grower’s movement. . The strategy of the government had two sides: bringing these allies to speak on one hand, and on the other hand treating their demands as totally independent of its campaign to promote the highway. In response, Adolfo Chávez offered another point of view by saying that these figure’s presence was the best illustration of the division among indigenous communities created by the government, and of the lack of respect it has for indigenous people’s own processes of self-government. In his presentation, Minister Romero denied that any highway project yet exists in TIPNIS, continuing to claim that Segment Two of the highway is entirely independent of Segments One and Three. With the annulling of the government’s contract with the Brazilian construction firm OAS, he said, the project which had begun is now “merely a possible road” in the future. Therefore, he claimed, the 2012 consultation is now a “prior consultation” as required by international standards. He said the current government is more indigenous than any previous one, describing the representation of indigenous people in the national executive and legislature and the titling of Native Community Lands like TIPNIS. With a session of just one hour, and the lengthy presentation by the government (finally cut short by the Commission), little time remained for questions from the dais. But two members of the commission offered some. What was the form of environmental impact statement generated before the consultation process? What were the norms that regulated that consultation? What was the specific evaluation offered by the indigenous of the likely environmental and social impact of a highway? The Bolivian indigenous leaders brought with them abundant documentation ranging from their legal title to the territory to detailed community-by-community documentation of the flawed consultation process of the government. They extended an invitation to the Commission to visit the territory and to take a stand on the legality of government actions over the past two years. A full response from the Commission is expected in the months to come. During their trip, the indigenous leaders also aired their concerns with the American Bar Association, American diplomatic officials, legislators in the House and Senate Human Rights caucuses, and Georgetown Law School. Bolivia, the country that became synonymous with indigenous and environmental rights on the global diplomatic stage, is about to approve a Mother Earth Law that lacks the blessing of the country’s leading indigenous organizations and undermines indigenous communities’ rights to prior consultation. Thursday (August 23), the National Council of Ayllus and Markas of Qollasuyu (CONAMAQ) publicly walked out of the Chamber of Deputies’ drafting session on the “Framework Law on Mother Earth and Integral Development for Living Well” (Ley Marco de la Madre Tierra y Desarrollo Integral para Vivir Bien). CONAMAQ Spokesman David Crispin explained the walk out: “We in CONAMAQ dave decided to withdraw from the drafting because we do not want to be complicit, alongside the Plurinational Assembly, in building a Law of Integral Development that will damage the Pachamama/Mother Earth. nosotros del CONAMAQ hemos decidido retirarnos del tratamiento porque no queremos ser cómplices, juntamente con la Asamblea Plurinacional, en construir una Ley de Desarrollo Integral que va dañar a la Pachamama” The government had already broken off contact with the Confederation of Indigenous Peoples of Bolivia (CIDOB) and the government-backed alternate leadership of the organization does not appear to be involved in the drafting process. Readers of the English-language press may be thoroughly confused at this point. Doesn’t Bolivia already have a Mother Earth law, the strongest in the world? Many in the international environmental community know that Bolivia that introduced the concept of the Rights of Mother Earth to the world, hosted a global conference on Climate Change and the Rights of Mother Earth [past coverage: 1|2|3] in April 2010, and passed the Law on the Rights of Mother Earth [Wikipedia] in December 2010. 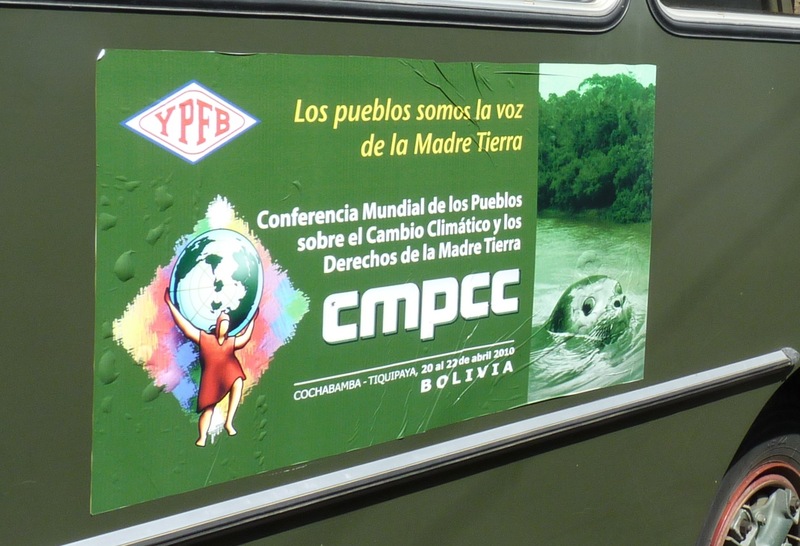 “We, the peoples, are the voice of Mother Earth” reads a bus placard at the Cochabamba eco-summit, sponsored by the state-owned gas company YPFB. Salazar’s position, embraced by the Evo Morales government as a whole, has been influential over the past two years. As highlighted by the TIPNIS controversy, the Bolivian government has prioritized national economic development over local indigenous choices; publicly vowed to ignore local opposition to transport, hydrocarbon, and mining projects; and backtracked from guarantees of indigenous rights to free, prior, and informed consent regarding projects on their territories. Alongside other left governments in the region, these policies tie continued mining, drilling, and pumping of natural resources to greater social spending, a combination called “neo-extractivism.” The transformation of the Law on the Rights of Mother Earth into a Law on Mother Earth and Integral Development reflects all of these trends. The draft law (complete text), already fully approved by the Bolivian Senate, declares a governmental obligation to “Promote the industrialization of the components of Mother Earth,” while surrounding this objective with extensive promises about respecting the rights and development of indigenous nations and peoples, safety monitoring, clean technologies, and so on. In short, “Integral Development” in the proposed Bolivian law is about conditioning industrial extraction on environmental compliance (the environmental policy framework embraced throughout the West, from the Clean Air Act to the World Bank), not about rethinking the extractive model. The draft only keeps “Living Well as an alternative civilizational horizon to capitalism” and “Equilibrium with Mother Earth” by way of proclamation (i.e., propaganda). The Draft Law does not propose a change in the structural basis of the capitalist system, nor reconfiguration of the nation-state. El proyecto solo conserva el “Vivir Bien como horizonte civilizatorio alternativo al Capitalismo” y el “Equilibrio con la Madre Tierra” de manera enunciativa (propaganda). El Proyecto de ley no propone un cambio de las bases estructurales del sistema Capitalista, ni una reconfiguración del Estado nación. Mother Earth Defender’s Office unspecified — Both the new law and the December 2010 call for the creation of a Defensoría de la Madre Tierra, equivalent in rank to the Human Rights Defender’s Office (Defensoría del Pueblo, often called the Human Rights Ombudsman). However, other than a one-year deadline, no specifics are included in the new law. This verbiage makes indigenous consultation into just another phase of the approval process for “using and appropriating Mother Earth.” The protections for indigenous rights and the idea of a new relationship with the Earth and its ecosystems have been shelved for now in the Bolivian legislature. Please forgive the past three months of quiet on this blog. My April and May were filled with organizing around May Day and the Free University in New York City. June saw a succession of alternately joyous and traumatic personal events. Through it all, I’ve been microblogging at @CarwilJ on Twitter; so please turn there for updates. On two of this blog’s central fixations, Bolivian indigenous movements and contentious protests, this months have been anything but silent in the real world. It would be futile to try to summarize the past 90 days, but you might want to turn to these excellent English-language sources: Andean Information Network on the May protest wave (1 | 2) and on the police protests-turned-mutiny: May 30 | June 25. A compilation of coverage of the Ninth Indigenous March and the TIPNIS conflict is at Dario Kenner’s Bolivia Diary. The blog’s own articles on TIPNIS often provide a great deal of depth. If there is one defining new aspect of Bolivian political protest in Evo Morales’ second term (since January 2010), it has been counter-mobilization. With the political right thoroughly defeated, many tensions emerged within the grand coalition of social movements that lent their votes and their marching feet to defend the government for the previous four years. When these groups took to the streets (or, as often happens, took over and shut down the streets) with demands that were unpalatable the government, one way for the Morales administration to resist has been to mobilize other sectors in return. Counter-mobilization within the grassroots is sometimes successful, and sometimes only delays negotiations and concession, but it always comes with a price, damaging previous alliances and increasing distrust among former allies. Since last October’s Eighth National Indigenous March won a law prohibiting construction of the locally-opposed Villa Tunari–San Ignacio de Moxos Highway through the Isiboro–Sécure National Park and Indigenous Territory, the Morales government has shifted counter-mobilization into high gear on this issue. From December to February, the organization CONISUR—consisting of the now vastly outnumbered indigenous residents of Polygon 7, an area of TIPNIS colonized for coca—led its own march for the highway. Morales conceded to this march a new consultation process, which the Subcentral TIPNIS opposes. In the process, it became clear that CONISUR communities are themselves engaged in coca growing on private plots of land; the organization affiliated itself with the Six Federations of coca growers and was expelled from the lowland indigenous confederation CIDOB. In March, local TIPNIS organizations rejected the “prior” consultation and began preparations with CIDOB and the highland traditionalist movement CONAMAQ for a Ninth National Indigenous March, in defense of TIPNIS and advancing other indigenous demands. The government began conceding local demands to regional indigenous organizations in April in a bid to lessen support for the march. Indigenous solidarity and the need to advance local agendas for territory, rights, and material support have been put at odds during this process. Still, of the eleven or twelve regionals that signed agreements, just five distanced themselves from the march (count per Emily Achtenberg) and some of their prominent leaders marched anyway. Since the march began, however, divisions within the CIDOB umbrella have deepened into an institutional crisis. Led most visibly by Rosendo Alpiri, president of Central de Pueblos Étnicos de Santa Cruz (CPESC, the regional organization for Santa Cruz department), leaders who stayed at home during the march have begun a contest for power over CIDOB. In early June, nine regional leaders met and officially suspended CIDOB President Adolfo Chávez. Chávez deemed the meeting illegitimate and CIDOB Vice President Nelly Romero accused the government of intervening in CIDOB’s affairs. This week, with over 1200 CIDOB and CONAMAQ marchers still encamped in La Paz, the pro-government CIDOB dissidents have begun a Grand National Assembly of Indigenous Peoples (GANPI), a congress that is traditionally the highest decisionmaking body in the organization. The Asssembly of the Guaraní People and the Indigenous Organization of Chiquitanos are both boycotting the gathering. Early signs indicate that the Assembly will fully adopt the government agenda: reintegrate CONISUR and its leader Gumercindo Pradel into the organization, and (one presumes) accept the government’s proposal for consultation in TIPNIS. Meanwhile, Adolfo Chávez and the camped marchers also continue to act as CIDOB. (Mass marches are a longstanding CIDOB tradition, and involve creating a self-organizing community that essentially represents the organization for the period of the march.) Chávez himself returned to Santa Cruz this week and (according to Santa Cruz daily El Día) is currently occupying his own headquarters along with a group of followers. Rosendo Alpiri pledges to install the new leadership in the headquarters and has invited President Morales to attend. It’s one thing to deploy a strategy of countermobilization when two groups have very different interests around an issue. For example, it’s no surprise that coca growers who hope to expand their plots into the Isiboro-Securé National Park and Indigenous Territory along the highly disputed Villa Tunari–San Ignacio de Moxos Highway have marched in support of it. It’s something very different when countermobilization takes the form of attempting to split, or even break up organizations, bringing down any leader who challenges the government line. When governments stop taking seriously the independence of social movement organizations and instead demand that movement leaders toe the government line, you no longer have what Bolivian Vice President Álvaro García Linera promised would be “a government of social movements.” Instead, you have a corporatist system, a return to the days when presidents like Hugo Banzer headed the national peasant organization and essentially negotiated with themselves. The tactics for outside control of grassroots organizations are such a big issue that protections against them are written into international indigenous rights standards. The right to “free, prior, and informed consent” by indigenous peoples over projects and policies that affect them and their territories requires that indigenous peoples’ own freely chosen institutions be the vehicle for that consent. To waver from this requirement, to “persuade” with large gifts, to station troops within communities, or to implant leaders chosen from outside, invalidates the “free”-ness of any consultation process. (Those of us who have been involved in indigenous solidarity for a long time have seen this strategy deployed by governments hostile to indigenous rights and resource extraction companies seeking local cover for their projects. For a detailed example, it’s worth reading about how oil giant ARCO helped to create the indigenous organization DICIP when it grew tired of being criticized by the Organization of Indigenous Peoples of Pastaza, OPIP, in Suzana Sawyer’s book Crude Chronicles.) Unfortunately, tragically, the Evo Morales government, which has long identified with indigenous peoples, is now deploying every one of these tactics in the TIPNIS conflict. Update, 29 March: My full English translation of Resolution 1 now appears after the jump. The traditional leadership of 40 or 41 communities in the Isiboro Sécure National Park and Indigenous Territory (TIPNIS) met this past weekend in Gundonovia, a community inside TIPNIS. With their offer to Evo Morales to attend and negotiate rejected, the meeting focused on their strategy to respond to the after-the-fact consultation law (Law 222) passed in January. To reject Law 222 and to emphatically reject its implementation, for being a norm that was not consulted and that is illegal and unconstitutional, which violates the rights of indigenous peoples, the territorial and collective rights established in various national and international norms that form part of the Constitutionality Block established in the [Bolivian] Political Constitution of the State. That this law  was not previously consulted with the three peoples who inhabit TIPNIS; is not free, but rather is being imposed by force; is not informed, insofar as there is manipulation of information concerning the reach and effects of this law, which are hidden by the state; and that same state never shared with us all the information about this project, and does not deal in good faith because the State seeks to include persons who have renounced their rights to decide over [the fate of] the lands collectively titled to the communities of TIPNIS, and finally does not seek any accord or consent. The meeting was slightly smaller than expected for two reasons: difficulties in representatives of 15 communities arriving due to government restrictions on boat fuel (the government classifies it as a “cocaine precursor” and obstructed sale) and other unspecified pressures from the government. TIPNIS leaders expect these fifteen communities to fully participate in the march and local resistance. The remaining eight communities seem on the verge of ending collective land rights, dividing up their territory, and joining the cocalero-union affiliated communities in CONISUR. “That’s how it is,” sighed Andrés. The construction of a highway that cuts through the heart of TIPNIS is like amputating an arm. Before proceeding to consult with you as to whether I should amputate or not, I have to demonstrate that it is the only option, that there is no other choice, that without it any integration whatsoever between Cochabamba and Trinidad is impossible, that any other alternative is riskier, not technically viable, or financially unsustainable. It’s not right for you to accept losing an an arm unless I first put all the options on the table. This is the case with TIPNIS. They want to have a consultation without first having realized a serious analysis of the alternatives for integration by road. The obligation that comes before any consultation whatsoever is to bring together a commission in which all participate: the TIPNIS indigenous, the representatives of Cochabamba and Beni, the national government, experts on engineering and the environment. This commission is to bring us in a reasonable period an analysis of all the possible routes for integrating Cochabamba and Trinidad by road, together with their costs, impacts on indigenous communities, and on our Mother Earth. Once we have all these alternatives, then on that basis, it is possible to conduct a responsible consultation. There are those who say that to go alongside TIPNIS or any other option is not viable. Perhaps they are correct… but this has not been demonstrated. Therefore, what is appropriate is to analyze, without passions or caprice, all the options. The result of the study o the different options will perhaps lead us to the conclusion that there is another option, or there are various other options, and that it is not necessary to conduct a consultation to see if TIPNIS should be cut in half, or it will lead us to a consultation to decide clearly between one option or another, knowing the pros and cons of each one. What one cannot do is to “consult” with someone as to whether their arm should be amputated or not, without showing them the other options.